Wycombe District Council looks like holding the final link in bringing London Wasps Rugby Club to Adams Park as tennants for the 2002/3 season and beyond. While there has been no official statements from either club, Wanderers Chairman Ivor Beeks revealed to the Bucks Free Press "We have made an application for a legal determination of the local authority about the playing of rugby which is within the same use-class border". Earlier in the month it was revealed that Wasps had applied to Rugby England Limited for permisison to play their home matches at Adams Park next season with all pointers leading to the conclusion that the deal is now merely waiting for the nod from Wycombe District Council. Fans from both Club's have been frustrated with the fact that, while there has been little official word on the matter, the chiefs from both set-ups have been only too happy to pass on seemingly 'exclusive' information to the press and supporters' club's. In one so called 'exclusive interview' with the Bucks Free Press, Wasps Director of Rugby Nigel Melville, said of the move "It's with the lawyers at the moment. I hope we can get it sorted within the week. Prices and money is not the huge issue." Recent press speculation has linked Melville with an equivalent vacant position at Gloucester Rugby Club, a story that has further unsettled Wasps fans. Meanwhile Wanderers Chairman Ivor Beeks was further quoted in the Bucks Free Press on 22nd February as saying "Our discussions with Wasps are coming to a conclusion for which we are very optimistic"
Chairboys.co.uk has learnt from various sources that Wanderers would recieve �0,000 rent in the first year and �2,000 in the second year, with Wasps having the option of extending the contract. In addition, Wycombe would be given �0,000 up front by the rugby club to help fund the cost of a new pitch and undersoil heating, the total cost of which is though to be in excess of �0,000. Wanderers would also have priority on fixtures and could ask Wasps to move games if necessary. 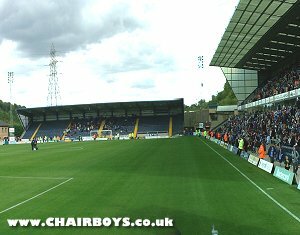 Wasps would keep the gate receipts from their games at Adams Park but Wanderers would receive a large percentage of the tea-bar, bars, hospitality and car parking income. One problem, however, might be trying to re-negotiate executive box leases which run into into the proposed term by The Wasps. The current terms are for seven day access and holders may be loath to a review of the conditions. A final decision on the proposals is expected within the first two weeks of March with a final deadline of the 31st March as this is the date before new Zurich Premiership guidelines on ground tenancy and fixture priorities are implemented. Not surprisingly both parties are taking the line that they will release no official statement until a deal is concluded. For Wasps fans they are left wondering just where their club will be playing next season whilefrom Wanderers point of view it makes a mockery of on the ongoing statements regarding improving communications with their supporters.